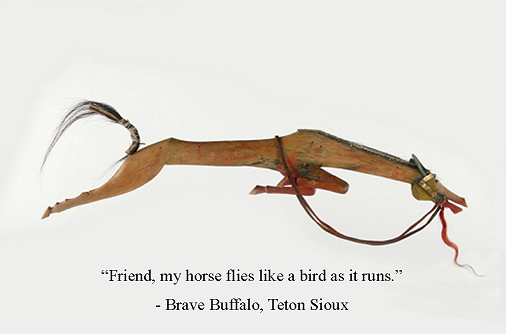 A masterpiece of Sioux sculpture, this horse effigy dance stick is one of only two known sculptures of its kind in the world. Carved out of wood, this 3-foot-long sculpture is enhanced by its real horsehair mane and tail. Leather reins and bridle exhibit the care with which this sculpture was made. The horse is also riddled with holes, bullet wounds. Red paint, blood, seems to seep from these wounds, suggesting that it died in battle. Blood also runs from the horse's mouth in the form of red horsehair. Its ears are backward slanting, showing fear and pain. The horse's elongated body and forward leaping motion suggest a leap from life to death. A Sioux warrior probably carved this piece around 1875 to honor his faithful steed that had died in battle. A short time later, this piece was collected by Mary C. Collins (1846-1920), a missionary at Oahe Mission and Standing Rock Reservation. > In 2014 and 2015, the Sioux Horse Effigy toured museums in Paris, New York and Kansas City.